SharePoint Wiki Redirect provides an easy way to manage different versions of wiki pages and control which version is displayed by default. This free SharePoint wiki web part gives you the ability to quickly toggle between the SharePoint wiki versions edited most recently, the latest approved/published version, and the version history page, deciding which version will be displayed whenever someone accesses the SharePoint wiki. The "Default Page" setting lets you choose between the SharePoint wiki page and the version history page as a default landing page, while the "Default Version" setting determines whether the latest version of the wiki or the most recently approved version is displayed as default. 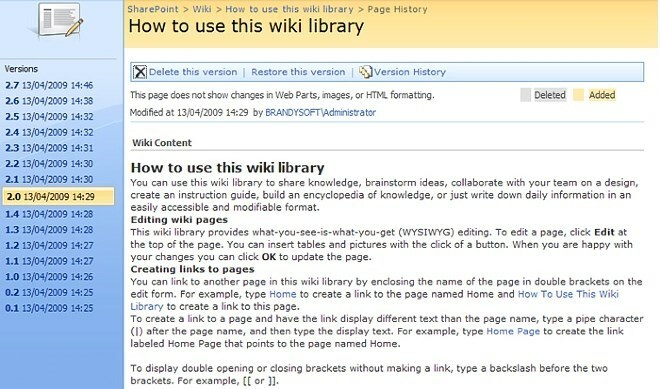 If the version history page and the current approved version of the SharePoint wiki are selected as defaults, the wiki page will automatically open the most recent published version, with a clickable list of other versions available on the left.